I wanted and want to like this book. Ursula Le Guin is this famous female science fiction author, and oh so many people like and love her writing and... and... and, well, I just don't. I recall reading other books of hers a number of years, okay, fine, decades ago, as a kid, and I didn't like those books then, and I'm not a fan of The Left Hand of Darkness now. I think Susan or Claire or both really like this book, which made me want even more to like it. I didn't. I am not a Le Guin fan, it seems. Even now, I wish I recalled what the other books were, so that I don't read them again. They were either A Wrinkle In Time or the Earthsea Trilogy, because, hey, they are considered Le Guin's kids books and I was a kid when I read them. Maybe I read both. I don't know, I don't recall. I do recall not being a fan of the story I had read, and that's fine. Lots of terms that the reader is supposed to pick up from context (or, let's be realistic, search for the term on the Intarwebs these days) began to annoy me. There's a level of explanation required to properly world-build, and, eh, Le Guin errored on the too vague side. With an entirely foreign Envoy, surely explanations could be easier. And the required suspension of disbelief that any sufficiently advanced planet wouldn't capture and kill any being who landed on their planet from the Void just boggles the mind. Consider our history, and, say, the Inquisition or the witch hunts or the level of blind violence in the last century? No, no interplanetary human, single or otherwise, would be allowed to live, much less have the freedom in the book. Upside, the plot moves quickly, and is interesting. If only the words hadn't gotten in the way. 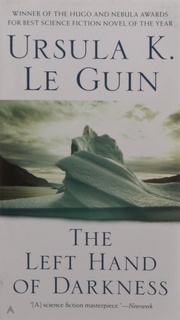 So, if a Le Guin fan, this book is worth reading. If a classic science fiction fan (this is the book that put Le Guin on the science-fiction map), this book is worth reading. If you're neither, eh, go ahead and skip, read Wrinkle or Earthsea instead. But the very use of the pronoun in my thoughts leads me continually to forget that the Karhider I am with is not a man, but a manwoman. Okay, why must an entity who is both a man and a woman in our classically defined gender roles be a manwoman? Why is she not a womanman? I'm more than a little annoyed that the male gender comes first, even from a woman author. Here man has a crueler enemy even than himself. An enemy, in Karhide, is not a stranger, an invader. The stranger who comes unknown is a guest. Your enemy is your neighbor. “The unexpected is what makes life possible,” he said. ... small cups of a fierce liquor were served, lifewater they called it, as men often do, and they asked me questions. If you play against your own side you’ll lose the whole game. That’s what these fellows with no patriotism, only self-love, can’t see. Here, the government can check not only act but thought. Surely no men should have such power over others. I felt that the truck was going east, and couldn’t get rid of this impression even when it became plain that it was going west, farther and farther into Orgoreyn. One’s magnetic and directional subsenses are all wrong on other planets; when the intellect won’t or can’t compensate for that wrongness, the result is a profound bewilderment, a feeling that everything, literally, has come loose. It is a terrible thing, this kindness that human beings do not lose. Terrible, because when we are finally naked in the dark and cold, it is all we have. We who are so rich, so full of strength, we end up with that small change. We have nothing else to give. Kindness there was and endurance, but in silence, always in silence. I was extremely ill after the last examination; the other, a middle-aged fellow, had some disorder or disease of the kidney, and was dying. As he could not die all at once, he was allowed to spend some time at it, on the sleeping-shelf. Imagine that. Someone dying, allowed to die. I never had a gift but one, to know when the great wheel gives to a touch, to know and act. I had thought that foresight lost, last year in Erhenrang, and never to be regained. A great delight it was to feel that certainty again, to know that I could steer my fortune and the world’s chance like a bobsled down the steep, dangerous hour. Estraven asleep looked a little stupid, like everyone asleep: a round, strong face relaxed and remote, small drops of sweat on the upper lip and over the heavy eyebrows. He lay in the tent, writing in a little notebook in his small, rapid, vertical-cursive Karhidish hand. He hadn’t been able to keep up his journal during the past month, and that annoyed him; he was pretty methodical about that journal. Its writing was, I think, both an obligation to and a link with his family, the Hearth of Estre. Ignorant, in the Handdara sense: to ignore the abstraction, to hold fast to the thing. “I’m glad I have lived to see this,” he said. I felt as he did. It is good to have an end to journey towards; but it is the journey that matters, in the end. “Fire and fear, good servants, bad lords.” He makes fear serve him. I would have let fear lead me around by the long way. Courage and reason are with him. What good seeking the safe course, on a journey such as this? “I and Thou,” he said. Estraven meanwhile engaged in his customary fierce and silent struggle with sleep, as if he wrestled with an angel. Winning, he sat up, stared at me vaguely, shook his head, and woke. “It’s the Ekumen’s custom, and there are reasons for it. Though in fact I begin to wonder if I’ve ever understood the reasons. I thought it was for your sake that I came alone, so obviously alone, so vulnerable, that I could in myself post no threat, change no balance: not an invasion, but a mere messenger-boy. "But there’s more to it than that. "Alone, I cannot change your world. But I can be changed by it. Alone, I must listen, as well as speak. Alone, the relationship I finally make, if I make one, is not impersonal and not only political: it is individual, it is personal, it is both more and less than political. Not We and They; not I and It; but I and Thou. Not political, not pragmatic, but mystical. His loyalty extended without disproportion to things, the patient, obstinate, reliable things that we use and get used to, the things we live by. He missed the sledge. To those fishermen-villagers who live on the edge of the edge, on the extreme habitable limit of a barely habitable continent, honesty is as essential as food. They must play fair with one another; there’s not enough to cheat with. I did not know if I had done right to send it. I had come to accept such uncertainties with a quiet heart. I had not had in mind when I spoke the contemptibility of suicide to these people. It is not to them, as to us, an option. It is the abdication from option, the act of betrayal itself. To a Karhider reading our canons, the crime of Judas lies not in his betrayal of Christ but in the act that, sealing despair, denies the chance of forgiveness, change, life: his suicide.